One practical and fast instrument: it is easy! 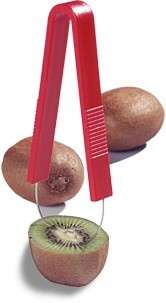 Just cut to half the kiwi and insert the instrument in a half of the fruit. Rotate and in a second peel and kiwi are separated.